Whether it’s the holidays, a birthday party, or just the weekend, there always seems to be a reason to celebrate. And when you go to a party, it can sometimes seem impossibly difficult to maintain discipline in your diet and nutrition. It’s all too easy to fall back into eating sugary snacks and junk food. In this post I’m going to list a few of the foods that contain a lot more sugar than you might have realized. If you can watch out for them, you’ll be doing your health an enormous favor! 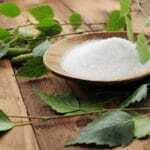 As I have discussed elsewhere, eating excess sugars can lead to Candida overgrowth, an imbalance in your gut flora that can weaken your immune system, play havoc with your digestion and lead to symptoms like fatigue, chronic yeast infections and more. The collective name for this group of symptoms, or syndrome, is Candida Related Complex. You will note that many of these foods here are already on the foods to avoid list for Candida sufferers. However, it doesn’t hurt to go over them again! And if you are already on the road to recovery from Candida, you might be thinking about reintroducing a few foods that you previously avoided. You should steer clear of all the foods in this list, and instead try low sugar foods like blueberries, beans, pumpkin, or green apples. Your regular pasta sauce is likely to be loaded with natural and added sugars. For example Bertolli Marinara sauce contains 12 grams of sugars in a regular 1/2 cup portion (and most people would use two or three times that amount!). Sugar will often be one of the top ingredients on the your jar of pasta sauce, but there are plenty of natural sugars in there too. Remember that the source of sugar is really not important – your body makes no real distinction between ‘natural’ and added sugars. Making your own pasta sauce, without added sugars, is a much better option than buying it from the store. Plain, probiotic yogurt can be a great source of probiotic bacteria and incredibly useful for anyone with digestive problems. However, the vast majority of yogurts on the market are flavored and full of sugar. 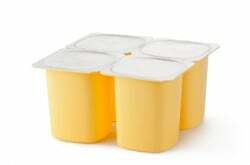 In fact, a typical flavored yogurt will have around 14 grams of added sugar in a six ounce container. Find a yogurt with live cultures and no added sugar, or better still make your own! All yogurts have a little sugar in them, even the plain probiotic ones, but in general the benefit of the probiotics outweighs the negative effects of the sugar. If you make your own yogurt, allowing it to ferment for longer will reduce the sugar content even more. You might be surprised how much added sugar is in your crackers. Take Graham crackers as an example. These crackers have a grainy kind of taste that makes you think they are healthier than they are, but each serving actually contains 8 grams of added sugar. Take a look at the ingredients and you’ll see sugar listed as the #3 ingredient, and molasses (a sweet byproduct of the sugar refining process) a little further down. In my Candida diet recipe book I have included a delicious cracker recipe that contains no added sugar. Coleslaw is mostly vegetables so it has to be healthy, right? Wrong, unfortunately! Most coleslaw recipes, and almost certainly the coleslaws that you buy in the store, contain large amounts of added sugar. How much? Perhaps 14 grams of added sugar in a single cup of coleslaw. 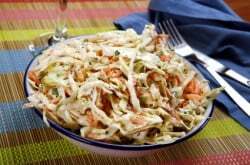 Making a healthier coleslaw is certainly possible. Try mixing your veggies up with some plain probiotic yogurt along with a little lemon juice and garlic. It won’t taste as sweet as the coleslaw you’re used to, but it will be much, much healthier. Walk along the cereal aisle in your local supermarket, and almost every packaged breakfast cereal that you see will contain large amounts of sugar. Look past all the healthy packaging – sugary cereals sell better, so that’s why your choices are so limited. Let’s look at a couple of examples. A serving of Kellogg’s Frosted Flakes contains around 25 grams of sugar, and a single pop tart contains as much as 17 grams. If you’re serious about maintaining your digestive health, read the ingredients labels carefully and avoid anything with added sugar. A few sugar-free alternatives for breakfast are eggs, buckwheat porridge, and probiotic yogurt. Check out our breakfast recipes section for more. Here’s a difficult one to avoid. You order the healthy salad, thinking that you’re doing the right thing, and then don’t think twice about pouring a salad dressing all over it. It might be hard to resist, but remember that the typical restaurant salad dressing contains lots and lots of sugar. For example, a small serving of Thousand Island dressing contains a full 10 grams of sugar. A simple salad dressing made of olive oil, lemon juice and sea salt is a much healthier option that you can make at home (olive oil is a Candida-fighting food with antifungal properties too!). If you’re in a restaurant, just ask them to make this instead of their regular dressing – they won’t mind at all. This one is a triumph of marketing over substance. We are all meant to believe that sports drinks are healthy options and just perfect for active people. But the truth is that most sports drinks contain massive amounts of sugar and are little better than a can of Coke. In fact, a typical sports drink might contain around 30-40 grams of added sugars. The amount of sugar in peanut butter varies wildly between different brands, but the most popular are generally quite high in sugar. Kraft Smooth Peanut Butter contains 1 gram of added sugar per serving. That might not sound like much, until you realize that the serving size is just one tablespoon! 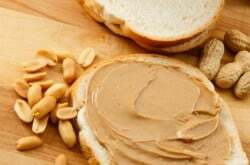 Of course, if you are following the Candida diet then you will already be avoiding peanuts, because they can cause inflammation in those of us who are particular sensitive to their high mold content. Try a high quality almond butter instead. If you are following the Candida diet, then regular bread is definitely off the menu (try making your own gluten-free coconut bread instead!). However, you should know that sugar is added to many different supermarket breads, even the ‘healthier’ wholewheat or multigrain varieties. The average added sugar is something like 4 grams per slice, but with some searching (and a lot of label-reading) it is perfectly possible to find a bread without it. 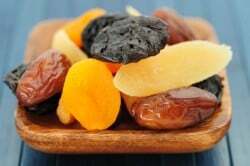 There are two things to be aware of when it comes to dried fruit. First of all, many dried fruit brands contain added sugar, so check the labels. And secondly, the drying process greatly increases the concentration of natural sugars found in the fruit. So even a fruit that is relatively low in natural sugars, like green apple for example, will see a dramatic increase in its concentration of sugar when it is dried. The Candida treatment plan that I created with Dr. Eric Wood contains lots more tips on how to live a low-sugar lifestyle and restore balance to your digestive system, as well as lots of tasty, sugar-free recipes to try! I’d find following this new lifestyle so much easier, if there were more healthy between-snacks available. I don’t suffer hunger pangs, but I’ve always been addicted to food – love the look, texture and flavour of yummy foods – and often just want to relish something between my teeth. Nuts are ok, though I am prone to overeating those, which causes constipation. I am not crazy about always reaching for celery sticks or carrots (which tend to have too much sugar if they taste good). Breakfasts have become somewhat boring. I alternate between eggs (frittata), hot quinoa cereal, almond bread and smoked salmon (my favourite) or leftovers. To boot, my digestive system has become somewhat slow in spite of new enzymes and probiotics, and as much raw veggies as I can stomach. It’s the pits. No, I am not overweight at all. Here are some snack ideas – https://www.thecandidadiet.com/candida-recipes-soups-snacks/. More to come soon! I LOVE YOUR WEBSITE. ITS VERY INFORMATIVE. Hi Yalonda, the Candida Diet Recipe Book contains a recipe for rosemary crackers and another for chia/flax crackers. Both in the Snacks section! My problem is that my five year old girl has got candida… How that happens… Well the doc said that some people are just prone to it, and diet. Well she on meds to kill the fungi , so called. But she has to change her diet… well I have to. Is there any advise you can give me? And you cook book will it work for the whole family?, not just my little girl. Hi Jenny, the recipes in the ebook are suitable for all the family. You obviously have to be very careful in terms of the supplements you give to your child, but cutting back on sugar will go a long way to helping her.